I recently learned about the nonprofit Crow's Shadow Institute of the Arts, established in 1992 on the Umatilla Indian Reservation in eastern Oregon to provide opportunities for Native Americans to develop their artistic gifts. It owes its creation to artist James Lavadour, a Walla Walla and one of the Pacific Northwest's most renowned printmakers. Also an exceptional painter of abstract landscapes, Lavadour understands deeply art's value as a transformative tool. The CSIA not only provides important youth services and educational and professional workshops on contemporary and traditional Native American art forms; it also is a world-class printmaking studio, where both emerging and established artists create monotypes, monoprints, and editions of lithographs, etchings, linocuts, and woodcuts. It takes only a quick look at the online Prints section to grasp what outstanding art is being produced there. But don't give CSIA's Website only cursory attention. If, as I am, you appreciate and collect fine art prints, you will want to spend time learning about the artists who come to CSIA to work with Lavadour and collaborating master printer Frank Janzen, formerly of the Tamarind Institute in Albuquerque, New Mexico. 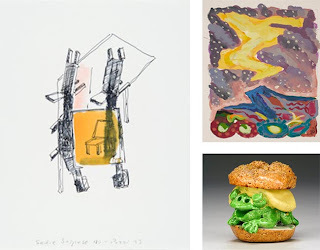 Among those artists are Rick Bartow, whose family has lived in Oregon for a century; Maori painter and printmaker Gabrielle Belz; glass artist Dale Chihuly, who created an edition to financially benefit the institute; Edgar Heap of Birds, internationally known for his public art, which uses traffic signs and other nontraditional media to make political statements; Truman Lowe, an innovative sculptor, former curator of contemporary art for the Smithsonian's National Museum of the American Indian, and professor emeritus at the University of Wisconsin; award-winning photographer Larry McNeil; and multidisciplinary artist Marie Watt, who has completed a number of residencies at the CSIA and conducted most recently a personal flag workshop. Art created at the CSIA is available for purchase and fully documented. There are some wonderful finds among the hand-pulled prints. You'll find a number of informative artist profiles at the CSIA site and on the institute's FaceBook page, beginning here. An article about the CSIA appears in the current issue of NMAI's quarterly magazine Indian. In 2000, Oregon Art Beat profiled founder Lavadour, who grew up on the Umatilla Indian Reservation; in the video, he discusses his marvelous work. Lavadour's paintings are the subject of James Lavadour: Landscapes (University of Washington Press, 2002). Go here for additional information about Crow's Shadow Baskets, Dale Chihuly's six-color lithograph with handwork, printed by Janzen at Crow's Shadow Press. silence to its very end. yesterday's already begun to fade. comes of fifty-nine years abruptly brought to end. for you whom we cannot hold. your going makes bright this once, and leaves us praying. what cleaves the heart when the door finally closes. when the door closes, and I, alone, am left praying. I don't want you to understand my poetry. I want my poetry to understand you. of Powderhorn Park. The blues of Lake Street and the 21A. the Twin Cities a lyrical flavor. . . .
Born in Magnolia, Arkansas, Roy Chester McBride — who, according to all his admirers, was "easy to love" — died July 29, 2011, age 67; he'd spent the last years of his life partly in Wisconsin and partly in Minnesota. A spoken word poet, McBride co-founded a local poets' group, Poetry for the People, in Minneapolis, Minnesota, as well as the Powderhorn Writers Festival. He also taught in Minneapolis-St. Paul schools and was a working member of In the Heart of the Beast Puppet and Mask Theatre. Through The Fathers: A Poetry and Spoken Word Celebration, McBride and spoken word artists Marcus Harcus and Chris Holister introduced poetry and spoken word to families with children. McBride was called "the old master of spoken word"* in the Twin Cities by filmmaker Mike Hazard, who made the poet the subject of a documentary A Poet Poets, a segment of which appears below. Hazard videotaped McBride at poetry salons, poetry slams, family get-togethers, and a variety of theatrical and other events, such as readings to benefit the Minnesota Alliance of Peacemakers. The documentary, released this past April, is available here. Another video of McBride reciting "Dreada Inna Babble-On" is here. The best post I've read about McBride is poet Lyle Daggett's at his blog A Burning Patience. Daggett knew McBride and not only provides background about the Minneapolis poetry scene of the late 1970s and early 1980s but also features a number of McBride's poems, which, Daggett notes, "often have a joyful audacity, socially and politically aware and keen-edged, poems of great tender compassion and vulnerability." You'll find Daggett's piece here. Note: This post was updated after its initial publication and now reflects two corrections brought to my attention by Lyle Daggett. My thanks to Daggett. The spoken word community of which McBride was long a part frequently featured in programs at KFAI Radio, as a search will show. McBride appeared on Write On Radio in April 2001. The show is included in the archives but not available for listening. ~ From "Keeping Our Small Boat Afloat"
* Bly quoted the full poem in this recent interview at Minnesota Public Radio. I profiled Bly, Minnesota's Poet Laureate, here. You'll find in my post a lengthy list of resources. you were or could be. declare who won or lost. I offer this poem for today's prompt at dVerse Poets Pub: Third Eye Open. Saturday Sharing is nothing if not eclectic. Just poke around today's edition to see what I mean. You'll find a noisy zoo of letters, a digitized Yeats manuscript, a site paying homage to the great poet Mahmoud Darwish, a map of counties that use different terms to describe carbonated beverages, a call for virtual volunteers at Smithsonian Gardens, and Adam Ryder's architectural atlas. For good measure, I've thrown in a video of a collaboration to produce an e-book using some highly developed HTML and Java Script. At The Type Directors Club: deVicq's "How to Make Love to Your Type" (Interactive), a promotional book also featured in Communications Arts design annual. ✦ Fans of William Butler Yeats will be heartened to learn there's a Love and Death manuscript archives online, courtesy of Boston College Libraries. You may view both the original manuscript and a transcription. ✦ Among poets, one in particular is a favorite of mine: the late Palestinian poet and author Mahmoud Darwish. Recently, I learned through the Being blog that the UCLA Center for Near Eastern Studies created a site, "The Legacy of Mahmoud Darwish" for its 2009 conference of international writers and scholars honoring the writer's life and work. On the site are a number of readings of Darwish's work, as well as podcasts, including a lecture by the eminent translator and poet Dr. Fady Joudah. ✦ The "Great Pop vs. Soda Controversy" may be settled but the Mystery Gardens Project is far from completed. Smithsonian Gardens needs your help tagging more than 80,000 images in the Archives of American Gardens. Go here and become a virtual volunteer. There are rock, vegetable, urban, herb, rose, community, historic, and formal gardens and greenhouses to describe. ✦ Photographer Adam Ryder gives you an inside look at his new book Areth: An Architectual Atlas, the fourth edition in his series Areth Analyzed, which documents architectural forms across three geographic regions: Northern Mountains, Central Basin, and Great Barrens. Diane turned herself into a killer. Donna mostly liked to spin real fast. one way or the another, as soon as not. she's been telling us all week. move and your buildings sway but me? Please! I can make your day. 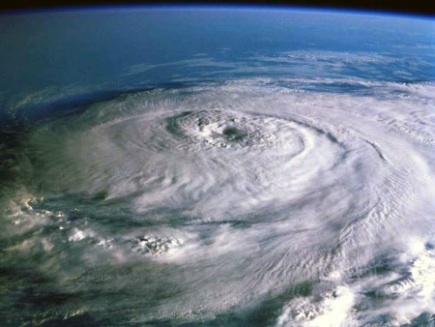 The news today is replete with stories about Hurricane Irene. I even came across a round-up of excerpts from short fiction, essays, and novels about storms by Sylvia Plath, Joyce Carol Oates, and other writers of note and this scene from King Lear proffered in Irene's honor. The poetry's been a bit sparse, however; so, after reading one more New York Times article about New York City's history of weathering such storms (I have a vested interest; my son lives there), I wrote the verse seen here. Feel free to add your own couplets in the comments section. ✦ The short film below introduces the work of Brandon Maldonado, self-described "painter of poetry" who recently had a show of new works at Santa Fe's Blue Rain Gallery. Born in 1980, Maldonado, who is color-blind, did not take up oil paints until he was 24. As the film reveals, Maldonado's work is informed by the influence of the fantastical and, as he notes, early exposure to graffiti reflected even now in his art. His themes are universal, their expression in paint what he describes in his Artist's Statement as his effort "to understand them and in return, bring that understanding into my life with the intention of making myself a better individual." See selections of his original paintings here and examples of original works on paper here. Online galleries of his art, both paintings and drawings, can be found at his Website. He exhibits worldwide. Intersecting Parallels from wes edling on Vimeo. ✦ An extraordinary textile — the only one of its kind in the world — has been loaned to the Art Institute of Chicago, where it in view through October. The textile is made from strands of silk from more than one million Madagascan golden orb spiders. This 10-minute video explains the textile's fascinating background and its creation. ✭ At the Cleveland Museum of Art, "CLE OP: Cleveland Op Art Pioneers" is ongoing through February 26, 2012. The show is drawn primarily from the museum's permanent holdings supplemented with loans from private collections. As its title indicates, its focus is on the key artists working in Op in Cleveland during the movement's formative years. According to exhibition notes, Cleveland had the only artist collaborative in the United States devoted to Op. Gallery views of the show, which includes work by Edwin Mieczkowski, Julian Stanczak, and Ernst Benkert (d. 2010), are here (click on exhibition title). CMA's Blogpost "What the Eyes See: The Magic of Op At"
✭ In Fort Worth, Texas, the Amon Carter Museum of American Art is presenting through October 9 a special exhibition, "The Allure of Paper: Watercolors and Drawings from the Collection". 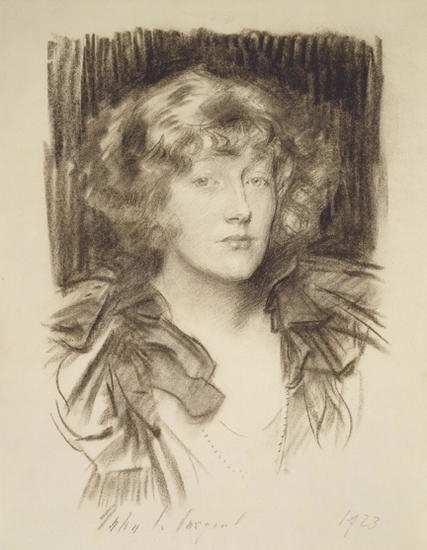 Organized to celebrate the museum's 50th anniversary, the show includes more than 100 drawings and watercolors by such artists as Edward Hopper, Ben Shahn, John Singer Sargent, and Joseph Stella, seen for the first time together. A catalogue accompanies the the one-of-a-kind works. ✭ Chicago's Art Institute offers through November 13 the contemporary basket artistry of Fujinuma Noboru (b. 1945). In the show, for the first time, are bamboo baskets from the artist's personal collection that were included in a gift to the museum. Noboru began his study of traditional Japanese crafts in 1974, apprenticing to bamboo basket maker Yagisawa Keizo. In 1992, a top prize-winning piece purchased by the National Museum of Modern Art in Tokyo launched his career. 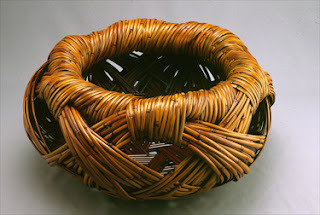 The artist uses such techniques as ara-ami ("rough" plaiting), varies the shapes of his baskets (some are tray-shaped, others cylindrical), and uses both dyed and undyed bamboo. The Art Institute has the largest collection in the United States of Noboru's work. Other institutions holding his work include the Ruth and Sherman Lee Institute for Japanese Art in Hanford, California. Videos of Noboru and his work are here and here. ✭ In Colorado, Denver Art Museum opens "Robert Adams: The Place We Live, A Retrospective Selection of Photographs" on September 25. Organized by Yale University Art Gallery, the exhibition, which will continue through January 1, 2012, will feature more than 200 black-and-white photographs, including contemporary Western landscapes, many shot in the Rocky Mountain region. The show will tour. Among several exhibition-related programs is "Takes on the Changing West: Provocative Talks by Our Regions Poets, Authors and Thinkers", scheduled October 6-20 (speakers to be announced). ✭ The second edition of an international contemporary art biennial, Prospect.2 opens in New Orleans October 22 and runs through January 29, 2012. Among the more than two dozen local, national, and international artists whose work will be on view are Sophie Calle, Nick Cave, Jonas Dahlberg, William Eggleston, and Dan Tague. Last month, poet Donna Vorreyer at Put Words Together. Make Meaning posted an invitation to write a "turned around" or "backward" sonnet. Her prompt required placing the rhyming words at the beginnings of lines, instead of at the ends, but otherwise maintaining the sonnet's structure and syllabic form. As Vorreyer points out, the exercise "messes with your head a little bit to have to rhyme first words" and also helps the poem lose "sing-songy-ness". This was my first attempt to write a sonnet (it's a revision of what I originally left in the comments section of Vorreyer's blog); my second effort, "Love Matters", is here and was followed by "A Naked Eye Turned Inward", posted here. To grow between them, I alone to mourn. Do rest, in time my own their space to share. Larks' joy in flight yet fail to sing sun's rise. Long for still. But yours, closed, return not mine. I place a rose, not stone, my heart it is. Days so long without you must seasons bear. Some months ago, I had the privilege to attend a talk by Washington's beloved artist Sam Gilliam, one of the most down-to-earth people anyone could hope to meet. He is a marvelous storyteller, with much to say about his early forays into art-making and what art-making means to him. He entrances when he talks about art. And when he speaks, you can't help but notice his huge hands, how he uses them to make a point, to invite you into the conversation, to show you how his brush might sweep across canvas or, delightedly, where in a painting you might first want to look to understand what the artist is showing you. I try never to miss a show of Gilliam's work — and this year, we in the D.C. area have been fortunate to find Gilliam at The Phillips Collection, where his Flour Mill was in place from January 29 to April 24; at the Katzen Museum at American University, where, from April 2 to August 14, his Close to Trees transformed 8,000 square feet of exhibition space on the third floor; and at the Corcoran Gallery of Art, which included Gilliam's expressive 75-foot draped canvas Light Depth in its "Washington Color and Light" exhibition from November 20, 2010, to March 6, 2011 and June 25, 2011 to August 14, 2011. Gilliam also was the subject of a wonderful retrospective at the Corcoran in 2005-2006. Gilliam, all Washington-Maryland-Virginia residents should be delighted to learn, has created a mural for the Takoma (Maryland) Metro station: From a Model to a Rainbow. Commissioned by the D.C. Commission on the Arts and Humanities and Metro Art in Transit Program, and unveiled June 11, the piece is signature Gilliam, and stunning. In the video below, Gilliam talks about his installation (can you hear the joy in his voice when talks art?). A mosaic of colorful ceramic and glass tiles mounted on aluminum, the mural is more than 400 square feet and weighs a ton. To learn more about Gilliam's Metro piece, see: "In a Station of the Metro, an Apparition of Color From Sam Gilliam", PBS NewsHour Art Beat, August 18, 2011. "A Collaborative Tour de Force: Mosaic Mural 'From a Model to a Rainbow'" at Mosaic Art Now, where my friend Nancie has posted a superb array of close-ups of Gilliam's mural. Press Release for Corcoran Gallery's "Washington Color and Light"
we snatched at the light, once given now taken — quicksilver. trade Venus for the light that had lost its source in Athena's storm. and a squiggle of moon's light to shadow our quiet remembering. and the light in our eyes to hold your going, sweetly, softly. we could store light deep, among myrtle wreaths, heart's own guide. then discovered too late how the light withheld brings rain. we never would recall the way light fell on your brow that morning. This is my first attempt to write a contemporary Ghazal, which, as this thorough post indicates, is "experimental with the 'what and where' of rhymes and refrains", and does not have a "formal signature couplet" but does "keep to single line couplets, pay attention to cadence and [is] associational." (Column width here forces some of my longer lines to spill over.) I've taken liberties and will leave it to you to judge how well my poem meets the form's description given here. I do intend to try the more traditional and formally structured form. This week's Blog Carnival takes as its prompt the word "childhood". I don't remember much of anything about my childhood but I do recall with delight all the many stories I'd read and act out for my only after tucking him into bed each night. He's 23 now, and I don't get to do that anymore, but I do get to tell on him. . . and me. Two stories we loved and read often together were Maurice Sendak's Where the Wild Things Are and Margaret Wise Brown's Goodnight Moon with its marvelous illustrations by Clement Hurd. My post that follows invokes these two delightful books, incorporating some phrases and lines that still come to mind, and includes a sprinkling of titles of stories from Grimms' Fairy Tales, which we also read aloud. is what we'd dream of when we tired of acting like trolls under bridges or bristly wolves wearing sheeps' skins while blowing down doors of poorly built straw houses. In our island lair (a bed and blankets made do), we didn't have to look out for Little Briar-Rose or hide from The Robber Bridegroom or worry that the Devil with the Three Golden Hairs would come looking for us. We didn't have to sit with some Old Beggar-Woman while she'd tell Stories About Snakes or conjure tales about The Girl Without Hands or make us use The Crystal Ball to mine her fortunes or solve The Riddle of who should marry the poor innkeeper's daughter. Those story-telling brothers, being ever Grimm, always made us eager for a wild rumpus to start. We liked being stranded, if only just before sleep, allowed to gnash our teeth in a place where we could be owner of this world, or sail off through night and day and still have time enough to practice powers that could slip through cracks, re-crack, and make any part of our kingdom that was not so good someplace better. we could be a king and not have to talk to stupid owls, get mad and eat anyone we pleased — plans or no plans. Sadly, we sometimes couldn't keep out the sadness, not even with an ice cream parlor, not even with a trampoline at the bottom of a swimming pool, not even with chicken soup and rice we'd stir and sip but once or twice. So, when things got too heavy, the shield against sadness too small to make us forget that having everything doesn't protect us from the terrible roars let loose when love goes missing, we'd pull out our Goodnight Moon and, looking all around our room, whisper our quiet goodnight noises everywhere. Today's host for the One Word Blog Carnival is Peter Pollock. Go here for information about participating and to access links to other contributors' posts. A schedule of remaining one-word prompts is here. Tim Brookes, who claims to have "fled" England for the United States some three decades ago — he eventually landed in Vermont — delights in "adventures in writing". See, for example, his posts at Egypt Diary, The Greatest Guitarist, and A Heart in Chaos, the latter of which he describes as "[p]art blog, part personal narrative, part scientific inquiry, and possible book-in-progress". His day job is directing the professional writing program at Champlain College, in Burlington, Vermont. An ordinary writer he is not. And because Brookes has so curious a mind, he engages in intriguing projects. One, The Endangered Alphabets Project, seeks to demonstrate in "a unique and vivid way... the issue of disappearing languages and the global loss of cultural diversity". Currently, that project includes an exhibition of 14 18-inch by 12-inch carvings, each of an endangered alphabet: Inuktitut, Baybayin, Manchu, Bugis, Bassa Vah, Cherokee, Samaritan, Mandaic, Syriac, Khmer, Pahauh Hmong, Balinese, Tifinagh, and Nom. Brookes's goal is to double the number of alphabets preserved and to take his project on the road to enlighten us about the importance of preserving these writing systems and the traditional cultures that created them. Brookes makes his carvings from beautiful slabs of Vermont curly maple, none the same in shape. To date, the carvings have been shown in Wales, at Rutgers University, Middlebury College, the University of Vermont, and several other colleges and universities, as well as at a number of libraries in New England. Fascinating as Endangered Alphabets is, I'm especially interested in Brookes's most recent related project: The Endangered Poem Project. This project, too, involves carvings intended to "draw attention to the world's vanishing scripts" and our need to preserve their written and spoken forms. The plan, as Brookes describes it, is to have a four-line poem he wrote — These are our words, shaped / By our hands, our tools, / Our history. Lose them / And we lose ourselves. — translated into 16-20 endangered languages in their original scripts (he currently has eight translations and has been promised 12 more), which Brookes then will carve into a vertical-standing sculptural form comprising four boards, each board facing a compass point, the overall effect being something like "a tall, hollow, wooden box". Brookes uses carbon paper to transfer the texts to the maple slabs. As of mid-June, Brookes had completed two of the boards. Some images of the carvings, including a photograph of one of the six-foot slabs, are here. Brookes is getting some serious attention for his labor of love. And rightly so. He is bringing together art and linguistic science to create something that is both aesthetically beautiful and culturally important. We all have a stake in his projects' outcomes. Tim Brookes, "An Essay in Wood" in Ogmios, Newsletter of Foundation for Endangered Languages, August 31, 2010 (pdf; scroll down to page 4.) In this interesting essay, Brookes fully describes his project and how he is creating the carved boards. In this video, Brookes explains the script Baybayin. See this Smithsonian Collections post about the Recovering Voices project focused on endangered languages and indigenous knowledge. against a forearm leave tracks asymmetrical. their capsules of prized protein and oil. done up as war bonnets, arrow shafts, and brooms. peeling open at dusk, tracking thick shrub. prick a way with whiskers long through night-fed burrows. To travel through the desert of the United States is to engage in a study of adaptation. The range of plants — some toxic, others not — and animals is extraordinary. The color and shapes of flowers, the textures of leaves and stems, contrast and not, with all serving some purpose in maintaining an ecological balance while also often benefiting humans and other animals. Yesterday, dVerse Poets Pub posted a feature on the poetics of texture, and this is my response to the invitation there to create a poem that evokes sensations of texture through imagery. All the plant life and animals mentioned in the poem are found in various areas of desert in our Southwest and West. We're well into the dog days of August. Today's highlights will let you do what the dogs do: beat the heat and stay indoors. You won't be disappointed in your explorations. ✦ PBS Arts has launched a 13-part series called Off Book that you may view online. The first of the bi-weekly episodes, Light Painting, features two photographers who demonstrate long-exposure photography and their use of color and kinetic light while shooting. ✦ A site I found through the Poetry Foundation's Harriet blog, ONandOnScreen comprises poems and videos. It's described as "a conversation between moving words and moving images, on and on." Among the features are Matthew Zapruder's poem "Poem for a Cloud Above a Statue", which is paired with Simon Christen's "The Unseen Sea"; and the collaborative poem and video "Invitation to Submit" by Jeannie Simms, Fiona Ng, Susie Hu, and Miles. The site includes bios and an archive that's fun to poke around in. For its current summer issue, ONandOnScreen partnered with BOMB Magazine whose BOMBlog is highlighting weekly a poem and video selection. ✦ Got an urge to see how poets write about medicinal plants and herbs? Whether your tastes run to aloe vera, bergamot, sorrel, or vervain, you'll find more than 50 poets' work on an A-to-Z list at Urban Physic Garden's Herbarium, which is also a print anthology that includes a CD featuring sound-poems and songs. The Herbarium launched July 22. ✦ Centos, erasures, and other forms of "found" poetry that use pieces of preexisting text (from newspaper articles, instruction booklets, dictionaries, speeches, personals ads, or any other text-based source) are celebrated in the new online quarterly The Found Poetry Review. The quarterly's site includes a series of weekly prompts, first launched July 5; you'll find links or sample texts as aids, and, after responding to a prompt, you may post in the comments section a link to your own poem or the poem itself. Submissions information is here. ✦ If you can't make it to Washington, D.C., before October 9 to see the Smithsonian's National Air and Space Museum's exhibit "NASA | ART: 50 Years of Exploration", do the next best thing: watch this video and then check the Smithsonian Institution Traveling Exhibition Service (SITES) tour schedule to learn whether and when the show is coming to your town. ✦ We take so much for granted. Imagine, as the children in this moving POV documentary do, having to wait for the arrival of books via donkeys. The children live in rural Magdalena Province, a poor and violent place deep in Colombia's interior, home to drug traffickers and armed gangs. Luis Soriano is the man who, with his "donkey library", awakens the children to the world of books. Also see A History of the Bookmobile. How to draw a simple bird from Marion Deuchars on Vimeo. The drawings are from illustrator Marion Deuchars's Let's Make Some Great Art. ✭ Last month, the Walker Art Center's blog featured process photos and explanatory text for London-based Polish artist Goshka Macuga's woven tapestry Lost Forty, part of the exhibit: "Goshka Macuga: It Broke from Within". What makes this such a fascinating post is its description of the use of Photoshop in the extraordinary art-making. Read "Compositing Goshka Macug's Lost Forty Tapestry (A Guide for Photoshop Geeks). A related, and another very good post, is here. ✭ The archives of the Smithsonian's Freer Gallery of Art and Arthur M. Sackler Gallery include a "squeeze" collection. As this interesting post explains, "A squeeze is a series of sheets of paper that are layered on top of each other and moistened to create a wet pulp. This substance is pressed upon the inscriptions of ancient monuments, creating a paper mold and capturing the impressionistic writing for a 3-dimensional negative effect." Learn more about the Squeeze Imaging Project, and the collection that is "the largest outside of Iran and Iraq". "3d Imaging to Unlock Ancient Mysteries"
✭ What's the next best thing for a painter who can't afford canvas? Apparently, marshmallows. Let no one tell you art isn't fun. ✭ New York City's Museum of Biblical Art is showing through October 16 "On Eagles' Wings: The King James Bible Turns 400". In addition to presenting the historical context for the translation and publication of the King James Bible, the exhibition features a series of paintings by International Arts Movement founder, contemporary artist Makoto Fujimura. Crossway Publishers commissioned Fujimura to design and illustrate an English Standard Version of the Bible to celebrate the 400th anniversary of the King James Bible's publication. Fujimura created five large paintings of the Four Holy Gospels and a series of smaller artworks for each of the Gospels' chapters. He uses water-based Nihonga ("Japanese-style paintings") materials. This video introduces Fujimura's commission and shows some of his exquisite work. Makoto Fujimura - The Art of "The Four Holy Gospels" from Crossway on Vimeo. ✭ For those of you lucky enough to be in Europe, Edinburgh International Festival, which opened last week, continues through September 4. The festival presents performances in opera, dance, music, and theatre; showcases visual arts, among them the exhibition "Hiroshi Sugimoto: Lightning Fields and Photogenic Drawings", inspired by the techniques of 19th Century photographer Henry Fox Talbot; and includes artist talks and workshops. The spotlight this year is on Asia's cultures, with artists from China, India, Japan, Korea, Taiwan, and Vietnam featured. ✭ The Pulitzer Foundation for the Arts opens "Reflections of the Buddha" on September 9; the first loan exhibition of Pan-Asian Buddhist art in St. Louis, the show, which will continue through March 10, 2012, features more than 20 masterpieces from seven important American collections, including those of the Asia Society in New York City, Harvard Art Museums/Arthur M. Sackler Museum, and the Nelson-Atkins Museum of Art. The artworks date from the 2nd Century CE and, in addition to hanging scrolls, include sculptures from Afghanistan, China, Korea, India, Japan, Mongolia, Nepal, Pakistan, and Tibet. 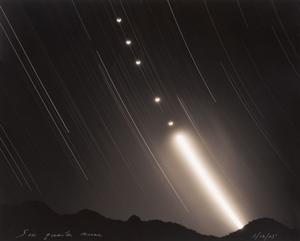 ✭ The Nelson-Atkins Museum of Art, Kansas City, Missouri, is showing through November 13 "Heavens: Photographs of the Sky & Cosmos". ✭ "The Dorothy and Herbert Vogel Collection: Fifty Works for Fifty States" remains on view until August 27 at the Art Museum of the University of Wyoming. The Vogels' gift to the museum includes such artists as Richard Tuttle, Gregory Amenoff, and Robert Mangold. Bottom Right: David Gilhooly, Frog Sandwich, 1977, Painted Ceramic, 4-18" x 3-5/8" x 3-3/4"
Vogel 50x50 Website (1,250 images; the collection numbers 2,500 artworks) This site also includes background on the Vogels as collectors; information on Fifty States participating institutions; audio and video; and a tour. The museum's exhibition of Seattle-based Etsuko Ichikawa's "NACHI between the eternal and the ephemeral", a fabulous mixed media installation Ichikawa created for the museum, ended earlier this month. Fortunately, a video was made of Ichikawa discussing her work. Inspired by the Kumano waterfall, Nachi, the installation is made of large glass pyrographs (drawings created with molten glass on paper), many thousands of cotton threads, and a video projection. Be sure to visit Ichikawa's site, hyperlinked above. Her work with glass, plastic piping, and mixed media is extraordinary. Also see images from her performance of Firebird at Tacoma's Museum of Glass in September 2010. The videos on her site are worth your time, too. Called family expands and contracts bounds. Prisoner of mind. It's nothing he did. How you look back is both your light and dark. Where you come from your going to must mark. At The High Calling, PhotoPlay editor Claire Burge issued a call August 12 for photographic submissions that respond to "five images that represent your history": Who made up your DNA? Where do you come from? What object is precious to your past? What memory resonates most deeply? What moment in history marks your childhood? L.L. Barkat followed up with her own post, "Get Historical in Pictures". In keeping with this month's theme at Every Day Poems and TweetSpeakPoetry, poets are invited to create a sonnet that "explains your history". I offer as my sonnet "How You Look Back". The history of my childhood includes the assassination of John F. Kennedy in November 1963, the rioting in 1968 that set Washington, D.C., on fire, and the decades of the Vietnam War Era, which did not end until I was in college and caught up my own family and all too many friends. Leave your submissions — photos or poems, literal or metaphorical historical pictures — on this FaceBook Wall by the deadline, August 24. Jim Meskimen is an actor (Frost/Nixon) who also happens to be brilliant at impressions. In this video, Meskimen does Shakespeare — Clarence's speech from Richard III — in 25 celebrity voices, including those of Jimmy Stewart, Garrison Keillor, Robert DeNiro, George W. Bush, Johnny Carson, President Obama, George Clooney, Droopy Dog, Ron Howard, and Richard Burton. His in-a-flash transitions are truly a wonder. fall prey, each left a dark dust cloud to flee. Like ancient tales our own we tell as new. A naked eye turned inward sees end through. There are many stand-outs in this collection. . . Two I especially want to mention. Both are titled "One Hundred". The first comprises a list of 100 names, grouped in no order discernible to the reader in a number of stanzas, at the end of which Siddique adds one or two lines of poetry. They are the first and last names of soldiers from the United Kingdom killed in our current wars. The second is like the first, except that the 100 names do not come from the Ministry of Defence, as did the first set; they are the names of those we have never recognized, names like "Abdul" or "Mohammada", names that in too many of the stanzas are fragmented — a first name with no surname or only a family name — all that remains of a person who once existed in full blood and is now reduced to a line in a list on a piece of paper. . . . In exchanging with me several tweets about those poems, Siddique pointed out that in the UK "it is an act of treason to read aloud the names of enemy combatants killed in current war." I could not get Siddique's comment out of my head. When I first read the poems, I was struck by their seeming simplicity, which was contradicted simultaneously by the enormous feeling I experienced in seeing all the names together on their page. Because none is just a name, and because a name is never just what we call someone. [. . .] Reading either of these poems is deeply affecting, marking, for some of us, our first time being in relationship with a name associated with a war-torn place where "[s]ky catches its breath / on the mountaintops", where "[w]edding voices / ring the mountain walls", where we leave behind "[t]he blue eye of the desert" . . . When we read those names . . . [w]e face directly the mortality the names represent. "It is an act of treason to read aloud the names of enemy combatants killed in current war." What happens when we look at those two poems in the context of Siddique's comment? By the very act of creating two lists, two different poems with the same title, concerned with the same subject, Siddique creates a deliberate separation: one group of human beings represented by one list of names, any of which might look like our own, set apart from another group of human beings represented by names that few, perhaps even none, of us shares. By setting each name in each group on its own line, Siddique deepens the division, among the names themselves and in our relationship to the names. By adding an end-stop, a period, at the end of each name, Siddique further elaborates the separation, forcing the reader to pause before going on to the next name. The device offers a way for the poet to say, This name belongs to an individual. See him for who he is, and then see yourself in his name. In dividing every name on both lists from the name that precedes and the name that follows it, Siddique plays up the fact that all these names, but for the wars in Iraq and Afghanistan, would likely never have been encountered together — and we would be forever unaware. War produces the unchosen relationship. It does not excuse how we differentiate it. As the poems illustrate, war requires us to regard the bearers of the second list of names, the names not English, not like ours, as different, and so necessarily distinct from whomever we do choose to recognize. It forces us to discriminate, and not in a good way. As I note in my review, the names in the second list are not whole. Siddique could not give us whole names; the UK's Ministry of Defence does not make it a duty to know who on the other side gets killed. The government's approach, in denying wholeness, in denying individuality, in refusing to accord relationship by treating all on the other side as "enemy combatants" or "collateral" (that last term one I've especially come to despise), provides us the out to view other human beings as something less than. How much easier it is to erase the meaning of being human than to acknowledge accountability for loss and thus responsibility for others' suffering. What you do not name, what you cannot or refuse to see, does not exist. Any one who has ever heard the reading aloud of the full names of those who died on 9/11 or who has visited the memorial at the Pentagon — where the names of those on the plane point in toward the building and the names of those in the building point out toward the plane; in other words, each in relationship to the other — knows the power of names to move us. Anyone who has ever seen a newspaper page of names of U.S. soldiers killed in our current wars, names that are whole, always include rank, almost always include age and place from, include place and date of death and details, knows how names set in unchosen relationship can make us turn away or force us to look at our own humanity and our own inevitable mortality. That we could hold it an act of treason to recite the name of another human being we have deemed our enemy and killed seems to me immoral. And so I ask: Who and what do you see and imagine when you first see or hear a list of names like "Amin", "Gul Bibi", "Khan Mohammad", "Farida", "Aziza", "Shekh Anwar", "Abdul", "Sayeda"? as a seal on a rock sings the sea. and know his own name again.